I am Mia and I have been called by many a “language freak”. From the time I was a little girl and I went to Spain in vacation with my parents, I loved to meet new friends from around the world and to try and learn something new in their language. Later on, when I was a teenager, I went to many European youth-exchanges where I met people from all sorts of countries and backgrounds and I got more and more interested in learning different languages. I went on to study German and English at school and later on at University and slowly my passion for teaching languages started drawing itself in front of me. This realisation came because when my foreign friends asked me about my own language, I was thrilled to tell them all about it! Actually, there was nothing I enjoyed more than to pass on the information I had about this amazing world of linguistics. I was born and raised in the amazing city of Porto, Portugal. As much as I enjoy languages, I was raised monolingual, and I only understood that I really had the “language-bug” at the age of 8 when I started learning English at school. From that moment on I never stopped. I took a bachelor degree from Porto University in English and German languages and literatures and later on a Master degree in teaching Portuguese to foreigners by the same Educational Institution. Meanwhile, I have lived in Holland for three years and I have studied Linguistics at Utrecht University. While studying Linguistics, I made an internship in London, at Queen Mary University, where I was also a Teaching Assistant for the Bilingualism Course. There I learnt many things about languages and how they work. 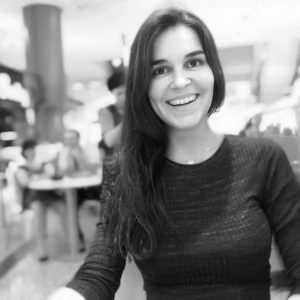 Besides this, I have a vast experience in teaching English, German and European Portuguese to children, teenagers and adults, not only in Portugal, but also in Holland and England. The contact with different people made me always search for better ways to teach and gave me the insight I needed to adapt my teaching techniques to the needs of every student. Besides this, I am now speaking (too much) 5 different languages more or less fluently and I have knowledge about many others, being beautiful Estonian one of them (Mia inserts random language knowledge to look more impressive. It is true, though). This website intends to fill in a gap that I have found existed through my students – the fact that the majority of websites on the internet just gives information and materials about Brazilian Portuguese, while European Portuguese is left a bit “forgotten”. The reasons behind this can be pinpointed to the fact that there are more people speaking Brazilian Portuguese and especially because companies see a bigger market in big Brazil, than in little (but great) Portugal. Well, this site will provide you with nice materials about European Portuguese, from blog posts, to worksheets, all the way to little ebooks. Just look around and see for yourself! Portuguese is spoken in many different countries by many different people (it is the fourth most spoken language in the world!). Portuguese is a lovely language, some saying it sounds like Russian, some saying it is very melodic and beautiful…I don’t know, you should decide. For me, it is awesome! Portugal is a great, small, “cute” country, full of pretty people and wonderful food. Just try our “nata” and you’ll see. So many more reasons I could name here, but I will let you see for yourself. Just come and dive into this beautiful language with me. And don’t forget, if you have ANY doubts, don’t hesitate to contact me through email, by message, through smoke signs….ok, not that, but all the others will do.